Whenever I go to Yellowstone there is always the mental preparations to be made. See i know that the sheep will be there waiting and always fun to work with. As i said they are not only interesting but comical at times. Everything else species wise is a gamble. Even something as common as a Raven or a Magpie is a gamble for getting a decent shot of. Normally this wouldn’t mean much because wildlife photography is basically just that, a gamble, we area out to photograph subject matter that may or may not be there when we arrive. We go to areas that better our odds of viewing and photographing species but there still isn’t any guarantee. One of these opportunities arose Sunday which is why i bring this up. Down in the depths of Lamar Valley where there are no settlements, no roads but one, and the only visible thing is the open country, we found a pair of Coyotes. 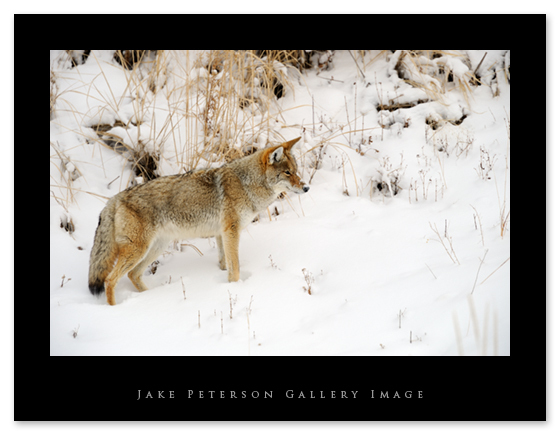 Now i really like working with Coyotes, cuz most individuals have that great rufous color to them that just looks great against the snow. Unfortunately when in a place like Lamar Valley two Coyotes don’t get a whole lot of attention, and i can remember a time last year sitting on a wolf kill after the wolves were gone and the Coyotes came in and everyone just stopped shooting but me. Anyways before i rant anymore, these two individuals were sticking together pretty close and our best guess was that they were probably gonna go off to mate sometime soon, since they were sent marking on offly lot which is a good indication of setting up territory. 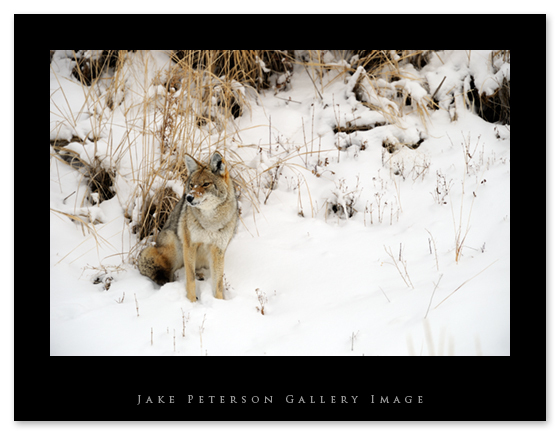 Dad and I were shooting out the car window just like old times, o that lovely pain in the neck feeling from holding the 600 was coming right back to me as i was trying to follow the Coyotes as they moved across the hillside, scent marking, sitting down and of course watching us. It was good. They eventually crossed the road which was what they were looking for the whole time and we knew it was time for us to go.